never really had a specific dream. 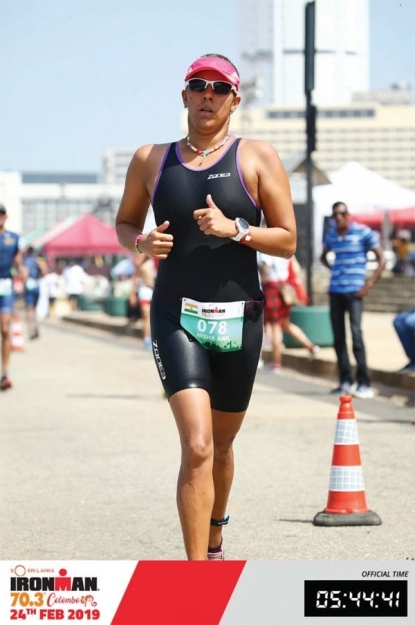 Now my dream is to live life to the fullest because we really don’t know how much time we have left here in this world, and to balance out my work life with my kids, family and some fun,” says Nisha Madgavkar, the Secretary of Goa Triathlon Association, who kissed her trophy of the Ironman 70.3 in Colombo Srilanka – a long distance 113-kilometre triathlon race organised by World Triathlon Corporation. The race consisted of a 1.2-mile swim, 56-mile cycling and 13.1-mile run. This inspirational woman, at the tender age of 12 years, became the first swimmer from Goa to represent India in Singapore for the Asia Pacific Aquatic Championships in 1991. Nisha comes from a family of sports oriented people and sport has always played a major role in her life. As a child, she enjoyed swimming and participated in many swimming events, winning most of them. “The downside of throwing yourself into sports is that you don’t really have any interests outside of that sport,” says Nisha, a woman who plays the role of an exceptional mother, a good wife and a strong sportsperson. Nisha, who is now 40, believes that age is not a limitation. She says that the main thing is not to think or say ‘at this age’. “I really do not feel a day over 25. One look in the mirror tells a different story though, so I don’t spend much time in front of a mirror anymore.” One can start working out at any point in life, the earlier the better, and must follow it gradually so that one doesn’t strain their body too much and wind up with injuries, she advises. As part of her daily health routine, eating healthy is very important to Nisha. “If a person can minimise the intake of sugar and processed food, it is very beneficial for the body even at later stages in life. Team it with a little exercise and every woman will be as healthy,” she says. Many women like Nisha Madgavkar have come to understand that the life of a woman doesn’t end after matrimony and bearing children, but goes on as long as one is willing to not give up. She advises every woman to start keeping healthy from a younger age so that you live and age well. There is nothing that can stop this phenomenal woman from exploring her dreams, as the saying goes: It is never too late to chase your dreams.